About one hour before serving, preheat oven to 350°. 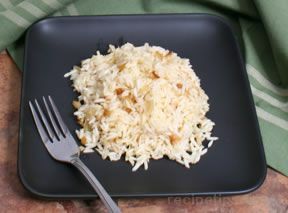 In a skillet over medium heat, cook rice until golden, stirring and shaking skillet frequently. Watch this closely. 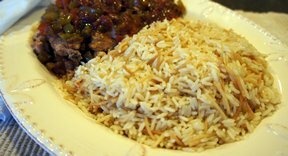 Remove rice to 2 qt casserole. In same skillet over medium heat, melt butter, add onion and cook until onion is almost tender. Add mushrooms and cook until onion is tender, stirring occasionally. Stir in chicken broth, water and salt. Heat to boiling. Stir hot broth mixture and uncooked noodles into rice in casserole. 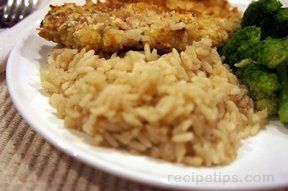 Cover and bake 30-35 minutes, until rice and noodles are tender and all liquid is absorbed. Just before serving, fluff mixture with a fork. Makes 6 servings.